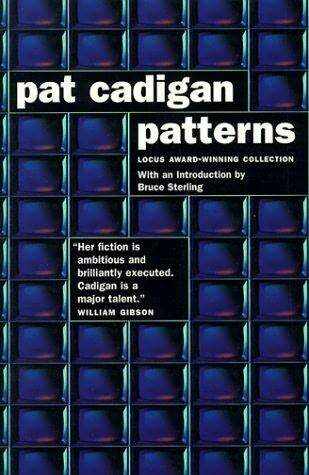 Patterns, Pat Cadigan, ??? ?, Ursus Imprints, ISBN 0-942681-07X, $22.95, hb, 207 pp. 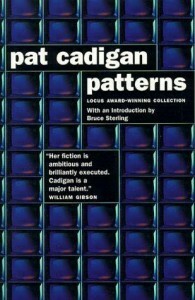 Another first collection, Patterns collects almost half of Pat Cadigan’s short fiction from the last ten years. Cadigan writes from the dark underbelly of society, and she usually works in the impact of technology on her characters. It was this style that placed her within the Cyberpunk movement at the time. But Patterns shows that Cadigan’s fiction centers more on people–it is the characters you remember from these stories, their problems, their horrors, their hopes–not ideas. Then there’s Martha, a businesswoman on her first trip to New Orleans in “It Was the Heat.” Caught between being just one of the guys and herself, Martha’s carefully created working mother persona melts under the hot sun, and she discovers that control is a delicate thing. Then there’s China in “My Brother’s Keeper,” the big sister from college who receives a goodbye postcard from younger brother Joe, the heroin user. She rushes back to save him, but finds that she needs to save herself. As indicated above, Cadigan gives us a much needed female perspective in science fiction, and her style is such that it doesn’t alienate male readers. If only more male writers could do the same for their female readers, science fiction could become the exciting prospect that was the hope of the cyberpunks. Until then, we should thank god that Cadigan is around to show what life, and literature, could be like. As of yet, this collection doesn’t have a paperback counterpart and can only be found in this small press edition; with any luck, however, you can still find a copy of this before they are all gone.